Innovating and supporting media literacy education everywhere. Our February 5, 2018 #K12Media chat focused on representation. We focused primarily on the Media Studies definition of representation and included recent examples from the Dr. Martin Luther King Superbowl ad. Representations do not reflect or mirror, the real world; they are selective constructions or textual choices. These selections or choices are mediated or influenced by the attitudes, values and beliefs of both the writer/shaper/speaker and the reader/viewer/listener. These selections do not give us “reality” but “versions of reality”. It is important to recognize that textual representations are re-presented versions of people, places, things, objects and concepts. These selective constructions do not reflect what is in the world. Representations are always influenced or mediated by ways of thinking about the world. They are not fixed but can change. We explored the ways that public figures may represent themselves as well as positive examples of representation by groups underrepresented by mainstream media. It was such a fruitful discussion that we decided to continue the conversation for another #K12Media chat, on Monday, February 12. We were glad to be continuing the topic because representation gets at the heart of so many of the key concepts of media studies and also shapes the ways we are conditioned to see the world. 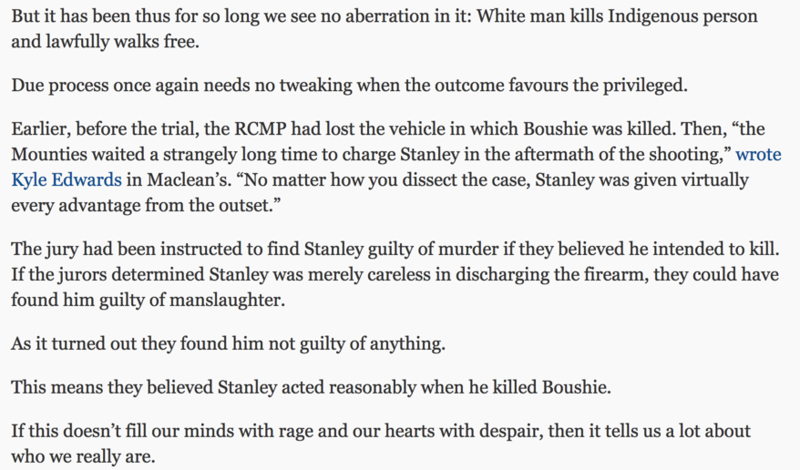 Many Canadians tuned into a court case and the not-guilty verdict of a man charged with murder. 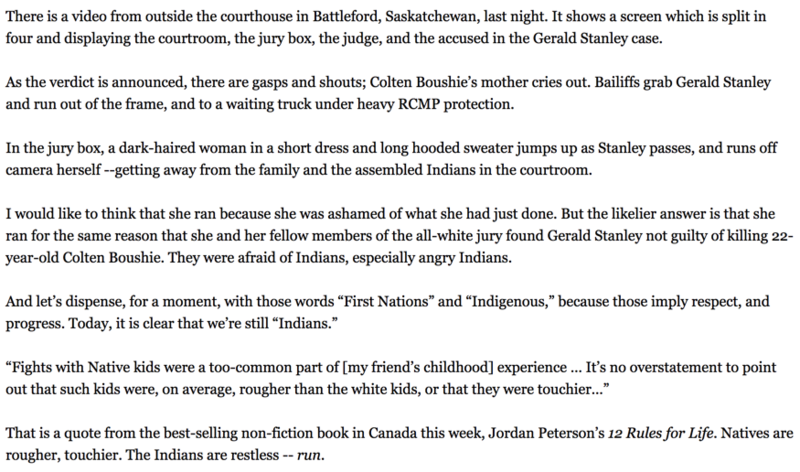 The response to this case has peeled back and revealed the ways that Canada—as a colonial nation—has been shaped by the representations of First Nations, Inuit, and Métis peoples (FNMI), as well as how immigrants have represented themselves. These representations are played over and over, subtly and not-so-subtly across a variety of media platforms. 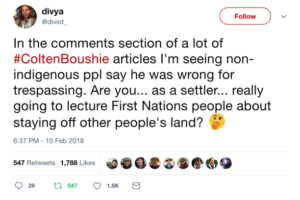 They show up in the ways that headlines are written and in the ways that stories about FNMI often carry powerful undercurrents. 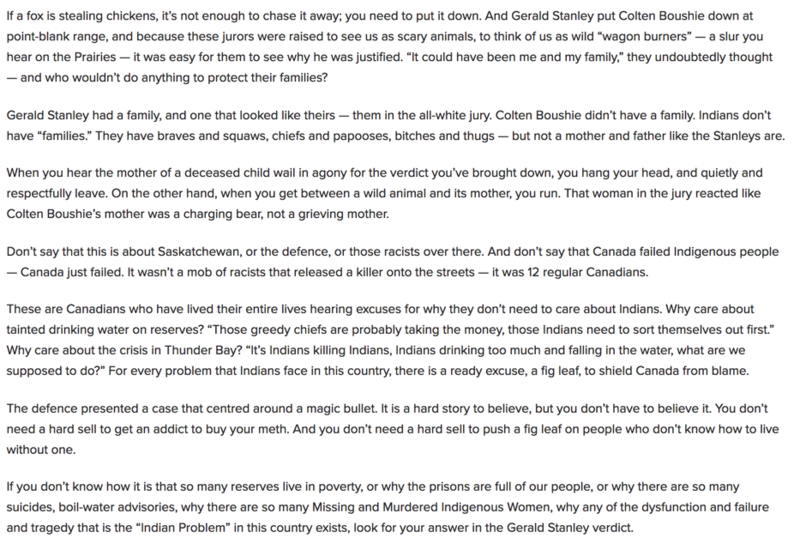 As women who benefit from white privilege from settler/immigrant ancestors, we live on land that has been claimed by Colonial Canada. 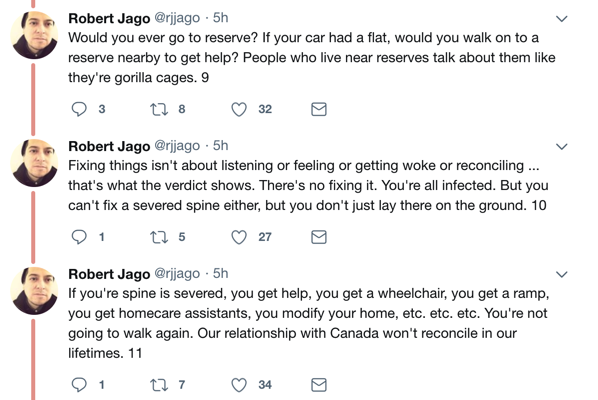 This colonial perspective affords us inviolable rights, rights that are not extended to people who do not look like us, may not speak like us, or may have ancestors who lived on Turtle Island (the Indigenous name) long before most of it became the land currently known as Canada. It is time to really examine the ways that this White Supremacy benefits some and limits many. To that end, the focus on representation this week will be directed toward the ways white supremacy is being constructed and reconstructed within and across a variety of media platforms. We offer you these very preliminary prompts and entry points for discussion. We will surely pick up on these threads during the chat February 12, 7:00 p.m., but we hope that you will begin conversations with your students. What is represented? What is missing? Is there any evidence that might point to how these aspects of the representation were selected? What might those observations reveal? Who has authored this piece? What biases and perspectives might they bring to the depictions within the piece? How do these choices/selections reveal attitudes, values, and beliefs of both the creator and the reader? What version of reality does the representation present? Who benefits? How might it be challenged? How might deconstructing representations help us to better understand ourselves and our world? The authors/perspectives below have been selected because we feel that they help us to better understand white supremacy and our colonial past and present. 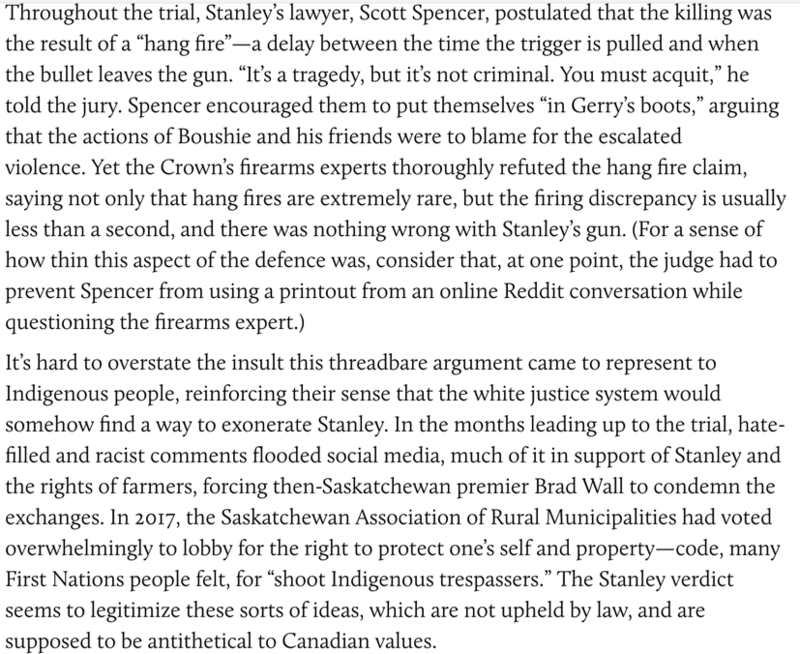 They challenge the representations of the Gerald Stanley trial and verdict in profoundly important ways. How long did it take the campaign to raise a significant amount? What are the catalysts for bursts of fundraising activities? How might the image of Stanley help the fundraising efforts? Why might some supporters choose to remain anonymous? What might this choice to remain anonymous reveal? 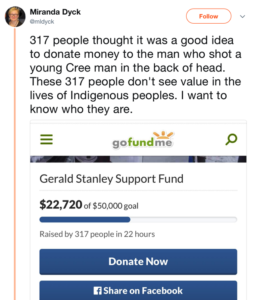 Why might some supporters choose to use the names of well-known indigenous leaders or to use other offensive names as donors to this campaign? How is white supremacy represented in the campaign? …in the list of donors? 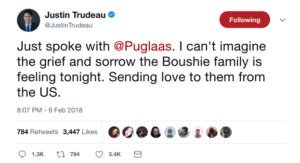 Who might object to the fundraiser (see below)? Why? 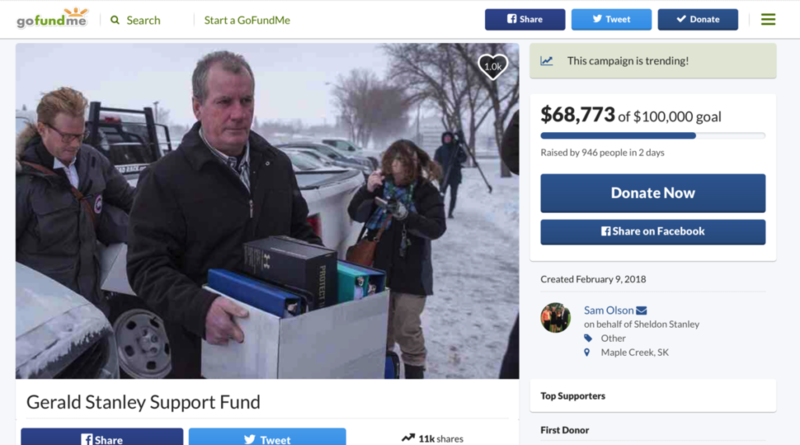 What are the rules for fundraising on Go Fund me? 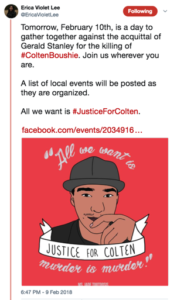 How did the fundraiser violate those rules? Do they remedy the situation? How does the new campaign language help us to better understand how rules can be circumvented? 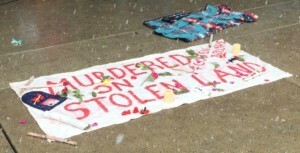 Does “naming and shaming” provide a disincentive for those who proudly support white supremacy? 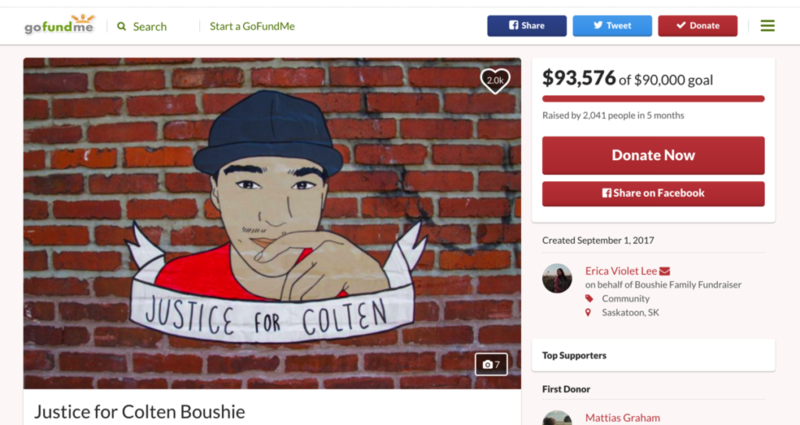 How might the image of Colten help the fundraising efforts? Why don’t we see the same kind of offensive names in this campaign that we saw in the Stanley campaign? What insights might we gain about white supremacy from analyzing this campaign? 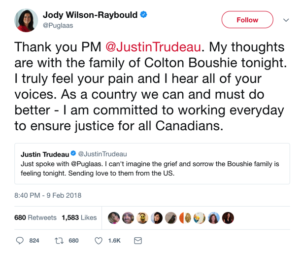 How do these responses help us to understand or process the verdict? Which approach is most effective? Least? Why? 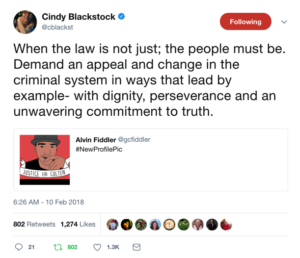 Which responses deal with the issues of injustice? Which do not? Why? 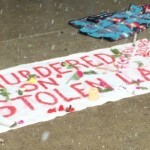 Look through the images from the rallies held across Canada. How are the rallies represented? How might these rallies be viewed as a response to white supremacy? What makes a rally effective? 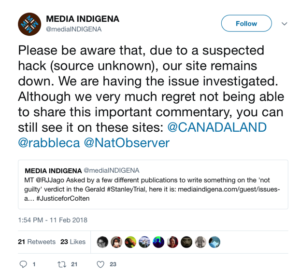 Why might someone hack an indigenous media site? Why might they target this specific issue? What might the suspected hack reveal about white supremacy? 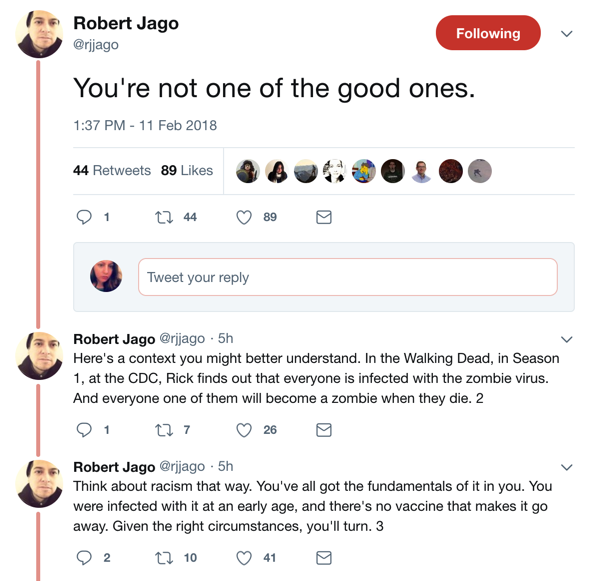 How might the perspective of callers to this show (or who may be expressing these ideas across other platforms) reflect ideas about white supremacy? What are some common characteristics of white supremacy that you can identify? About the differences of urban/rural experience? 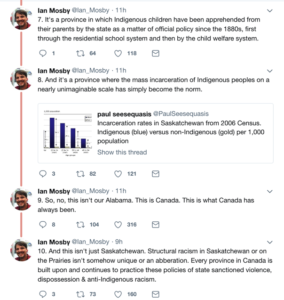 Do perspectives vary in different regions of Canada? What might account for those differences? Are we truly able to confront our country’s acceptance of racism and white supremacy? 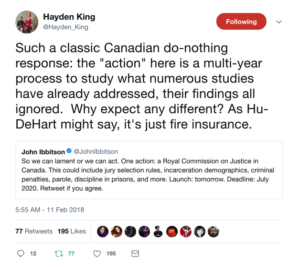 How might “studying” the problem deflect attention away from the problem itself? Whose interests are served by further study? What information do we already have from existing studies? 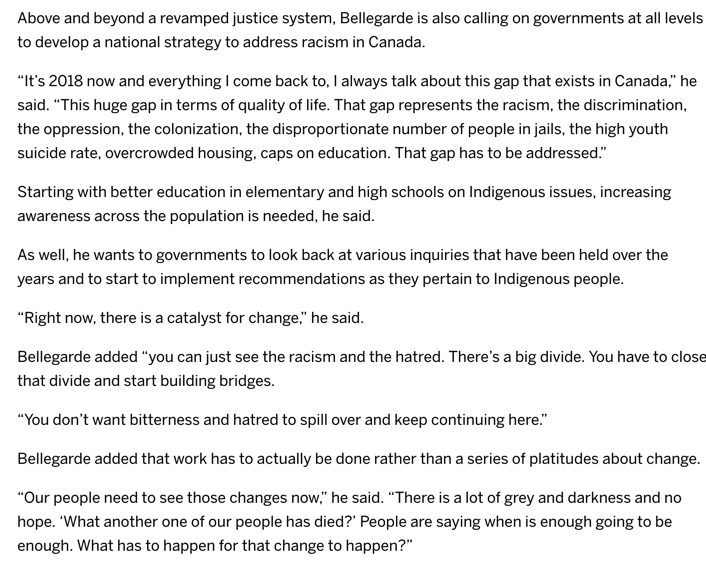 How could it distance racist/white supremacist institutions and populations from the issue? How might this process disenfranchise the people who are most affected by the problem? Can you identify more effective solutions? How does this poem illustrate the effects of white supremacy? How does having an all-white jury impact the family of the victim? 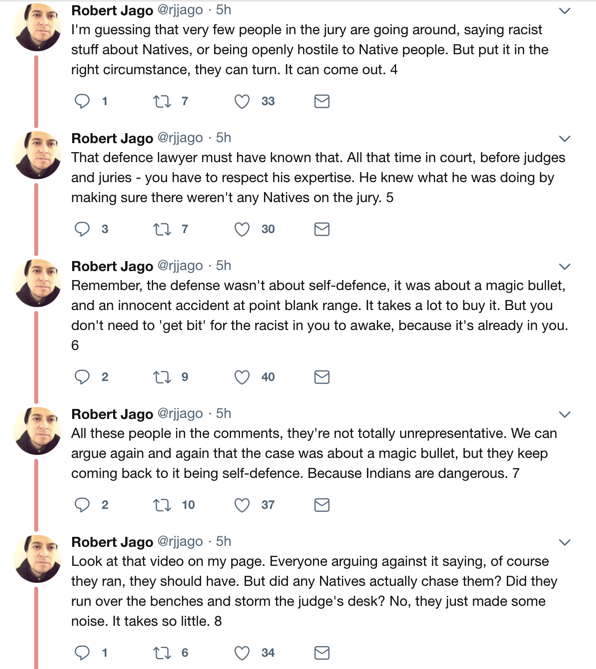 How does having an all-white jury impact the defendent? 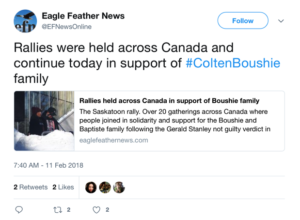 How did the family and supporters respond to the legal process? 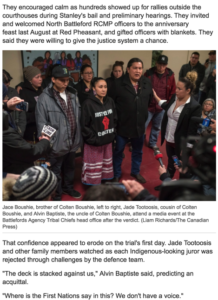 How did the legal process treat the family and supporters? 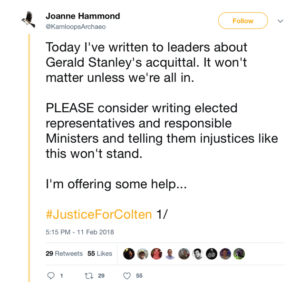 Op-eds and other well-meaning supporters compared the incident to the Southern U.S. in the 1950s or to the shooting of Trayvon Martin and other African Americans. Why might these comparisons be problematic? 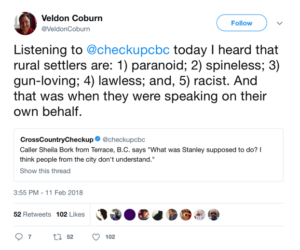 How do they then ask us to characterize Canada/Canadians? How might they help to hide our own profoundly disturbing history with racism/white supremacy? Fattal, Isabel. “Why Do Cartoon Villains Speak in Foreign Accents?”. The Atlantic. January 2, 2018. Nardozi, Angela. 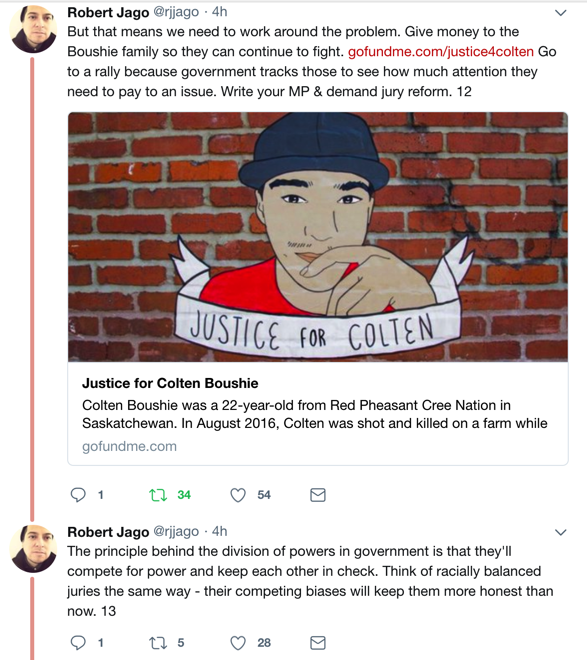 “No Justice for Colten Boushie” – list of resources for teachers about the case. Noble, Safia Umoja. 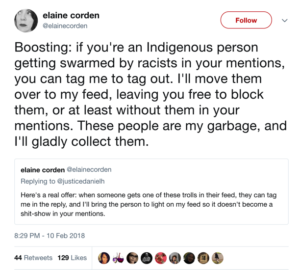 Algorithms of Oppression: How Search Engines Reinforce Racism. Noble, Safiya and Roberts, Sarah T. “Engine Failure”. Logic Magazine.